Do you race go-karts? If so, you likely already know how important it is to wear aåÊneck collaråÊon track. Designed to provide crucial neck protection in the event of a collision, roll, or off-track excursion, aåÊkarting neck collar can help prevent a broken neck or even death. If you are an experienced racer, you know this, but far too often, amateur karters invest in expensive helmets and race suits while failing to place any priority whatsoever in their neck protection. At_K1 Race Gear, we are dedicated to racing safety, and it is our goal to equip every karter, novice and experienced alike, with the equipment they need to stay safe. 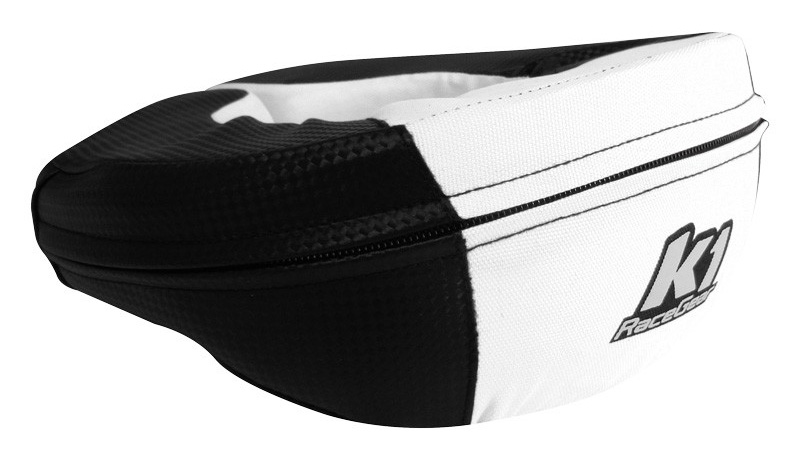 Our K1 carbon-look neck collar is just such an item; it will keep you safe on the track and looks good too! Put simply, it's a terrific product. K1 CARBON-LOOK KARTING NECK COLLAR: THE ATTRACTIVE SOLUTION Who says that safety equipment can't look good? While it's true that our_standard neck collarsåÊin red, blue and black work just as effectively as our carbon-look neck brace do, they aren't for everyone. Our K1 carbon-look neck collar is designed for those racers who are looking for something extra those racers who want to draw attention to themselves! åÊWhen it comes to safety equipment, however, form should never follow function, and we have developed our K1 carbon-look neck collar to perform. It has been designed, developed, and manufactured to provide both driver comfort and driver safety. With an anatomically designed rear helmet support and Velcro fastener for easy removal,åÊour K1 carbon-look karting neck collar is incredibly effective and convenient. As an added benefit, all of our neck braces are also machine-washable. The material that we use to manufacture our carbon-look neck collars with is stain-resistant and waterproof, so you can subject it to your worse and it will come out unscathed!